Northwest National Real Estate: Montana Log Home For Sale! Montana Log Home For Sale! Amazing 3-story log home for sale near Basin, Montana, this property appraised for $230,000 in June of 2014, that is before the sellers added a ton of updates this summer. Property is 19.9 acres and borders National Forest on 2 sides! Home is 3 stories with 3 bedrooms, 2 and a 1/2 bathrooms, office and is 2,700 Sq. Ft. 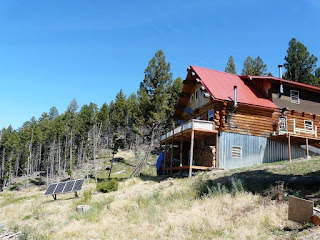 If you've ever dreamed of living in Montana and living a self-sufficient lifestyle this home is for you, it has an alternative energy system that includes new solar panels, windmill, batteries and top of the line Out Back power inverter! Sellers have taken meticulous care of this home and are continually adding new. Views from this property are incredible with thousands and thousands of acres of National Forest in your sight. You'll never get tired of sitting on the deck and watching all the wildlife while listening to the fire crackle in the wood stove. Call Scott Joyner at 406–223–6039 for your own private showing today. Priced at only $180,000.